After trying Stitch Fix for a few months and getting some cute pieces, I started thinking about how great it would be if I had a bit more control over what I received and the option to wear things a few times and then ship them back. I was talking about this to a friend and she asked whether I'd heard of a company called Le Tote. I hadn't, but I immediately looked them up and decided to give it a shot. I've been using the service now for just over three months and this is my honest review of the service - the good, the bad and the ways I think i could be better (it's a long post - I had a lot to say!). While similar to Stitch Fix, Le Tote is different in a lot of ways. It's also a personal styling service that sends you 5 items, but you get to keep those 5 items for as long as you want, wear them as many times as you want, then ship them back and get a new box of 5 new items. The cost is $50/month, shipping is free both ways and there's no limit on how many boxes you can get in a month. Where Stitch Fix uses your personal style profile and Pinterest board to select items that they think you'll like, Le Tote lets you select items from their collections and place these in your virtual online "closet," which is kind of like your wish list or shopping cart. When your box is arranged, the items that you've chosen will get priority if they're available. If not, a stylist will send you something they think you'll like based on your choices and availability. To build your closet, you can "shop" their website, either by item of clothing (skirts, sweaters, accessories, dresses, etc.) or by collection (denim shop, snow day, glitter, date night, office outfit). You can put as many items as you want in your closet, but that doesn't guarantee you'll receive those items. Each box you receive contains 5 items - three clothing items and two accessories. Accessories include jewelry (necklace, bracelet, earrings, rings, handbags, scarves) and clothing is everything else. When your box is being styled, you have a window of opportunity to make changes to your 5 items. You'll receive an email (or text if you sign up for that option) that your box has been styled and you can go into your account and swap out anything you don't like for something else. The selections are more limited at that point (you don't have the full range of everything to choose from). But if you know you want a dress for an upcoming event, you can swap out what you're slated to receive for three dresses and matching accessories, giving you a bit more power over your selections. If you love any of the items and want to keep them, just keep them and ship everything else back. They'll charge your card on file for those items (at a discounted price). If you keep the entire tote (all 5 items), you receive a month free. When you're finished with the items in your box and are ready for a new shipment, just send it all back in the pre-paid envelope. You can rate each of the items you received online in your style profile and see a full list of everything you've received at that point. Below I'm reviewing my first three boxes from Le Tote. I loved some of the items and I was indifferent about others. Some I hated and some didn't fit. But overall, I liked the majority of the items - not enough to buy them, but enough to wear them a couple times and ship them back to try something else. After doing Stitch Fix for a while, I realize how hard it is to get 5/5 items that you love, so if I get 2-3 items I really like in a box that fit well, I think that's a big win. And the great part about this service is even if I don't love an item, I can wear it (and usually get compliments on it!) and then send it back! It's gotten me out of my comfort zone a couple times, which I think is a good thing. I liked the black bird sweater and the striped dress. Both fit well and were super comfortable, although neither of them blew me away or anything. The sweater was a nice casual piece for weekends with the kids and the dress was perfect for work with leggings. The blue top/sweater was a bit short for me (I like length) and I couldn't really get used to the winged sleeves and cape back. It was fun to wear once or twice, but not something I'd ever keep. I liked the long necklace, but didn't get much use out of either pieces of jewelry. Everything went back within two weeks. This box was chosen completely by random - none of these items were in my closet and I decided to give them a go, just to try them out. I ended up loving that blue floral jacket, which totally surprised me! I never would have picked that for myself. I paired it with dark skinny jeans and a bright pair of flats. So fun! The purple wrap dress was great for work paired with a cardigan and tights, but it was nothing special. The cobalt blue dress was a really pretty color (and had pockets! ), but it was way too big on me, unfortunately. The necklaces were fine, but again, not something I got much use out of (I don't think I wore either one of them). (Sorry I didn't get a chance to take photos in these pieces - naptime did not last as long as I'd hoped.) Everything went back after a few weeks. I loved box #3 and would have kept everything in it, but for a few minor wear issues on a couple things. The black moto leggings were fun and fit like a dream, but they had some obvious wear on them, which was unfortunate (fine to wear for a few weeks, but not if I'm going to buy them). The blue shirt was a nice piece for work that I wore quite a few times and always received compliments on. It was a bit big on me and I wish I could have chosen a smaller size. The blue dog sweater was adorable and fun for casual weekend wear chasing the kids around. The necklace and scarf ended up getting so much wear that I kept them both! The necklace with the feathers is different than anything I currently have and adds a unique touch to plain outfits. And the scarf is a neutral-lovers dream come true - it combines white, cream, black, tan, blue, peach and yellows, making it so easy to wear with nearly anything. - You can wear the items in your tote as many times as you want, then ship them back anytime. No commitment, no hassle, no agonizing over price or whether or not to keep certain items. - Flat rate of $50/month, no matter how long you keep things, how many times you wear an item or how many times you exchange things. - Prompt shipping and great customer service. - Good variety of basics to shop/choose from in a lot of different styles. - Your items are chosen for you based on the "closet" that you choose for yourself. Great for people that like having more control over the items they receive and know the types of clothing, styles, colors, accessories and types of items they want to receive. - The items you select get priority, but you might receive different items as well. However, after your box is styled, you get the opportunity (a few hours after receiving an email) to switch out any items you don't like for others before your box ships, giving you even more control. - You can choose to purchase any item from your tote at a discounted price just by keeping the item. If you choose to buy the whole tote, you get a month free. - The totes seem to get better over time. I'm currently on my 4th box and my last two boxes have been homeruns. I don't know if the selection of items is getting better or I'm getting better at making selections. - Great brands! I love that I can try out these pieces from some really awesome labels and not have to pay full designer price. There are so many labels/brands that I recognize and love on Le Tote, compared to so many unknown brands on Stitch Fix. - The items you receive are not new and have been worn by others. Everything's been washed/cleaned, but the clothes are not new. Be advised there may be some wear and tear on the items. - Most of their items are pretty basic, with lots of staples and plain pieces that you can find nearly anywhere. While I like basics as much as the next person, I wish there were more hip/trendy/colorful/bold/unique items available. Staples are great, but those aren't the items I tend to want to wear one time and switch out. The selection of items does seem to get better over time (I think recently added a bunch of new inventory), but I wish there was a lot more variety in the clothes and the sizes available. - A few of the items I received had obvious wear/tear and damage. A bracelet clasp was broken, a sweater has a serious snag and a pair of pants had a ripped hem. The pieces were all still wearable, but not in pristine condition. I emailed customer service and they apologized and discounted my subscription, but I wish those items would have been more carefully inspected before they shipped them to me. - Your 5 pieces are split between 3 clothing items and 2 accessories. I would much rather have the option to choose all 5 (or even 4) clothing items, as sometimes I just don't love the jewelry/accessory selection available. Although, I will say that the only two items I've kept from my totes have been accessory items, so maybe I like them more than I realize. - When you choose to switch out an item before it ships, you don't get to choose from the full variety of options - you only get to choose from a limited selection of pieces that are currently available for shipping in your size. There's still a good variety, but much more limited. - While I love being able to swap out items I don't particularly like from my box online before it ships, I do miss the element of surprise that you get with Stitch Fix. I wish there would be one "mystery item" per box that you received, specially picked for you, that you couldn't swap out and didn't know what it would be until you opened the box. - I wish there was a better way to rate/review each item you received and leave feedback. The current rating system asks you if you like the style and if it fit, but there's not a way to leave comments about each item. Specifically, I'd like a way to let them know that perhaps a certain item was damaged or needed a hem fixed or a button replaced. There's no where to make comments like that on items. - I love that you can choose to purchase any item in your tote at a discount just by keeping it, but I also wish there was an option to purchase it brand new for the full retail price. I loved the tuxedo moto leggings, but didn't want the pay that much (I think it was around $60) for leggings that you could tell had been worn quite a bit. Absolutely not happening. However, I loved the fit and would have kept them for full price if I had the chance to buy them brand new. I really like this service and plan to keep using it for a while. I'm currently on my third month and 4th box and have loved quite a few of the items I've received. If you're someone that loves getting new clothes, wears them a few times right away and then quickly loses interest in them, this is perfect service for you (guilty). I admit that I get bored with things after I've worn them a few times (particularity if I've been photographed in them or seen by a lot of people). I like variety! Also, I work in a corporate setting and have tons of work clothes in my closet that still don't quite fit my post-baby body so I feel like I never have anything to wear to work that fits. However, I don't want to spend a lot of money right now on boring work clothes, so this has been a great way to have some fun new professional pieces to wear to work without the price tag of purchasing a new work wardrobe. Plus, it's always nice having a new item to wear out to dinner with friends or on a date night. If you're interested in seeing my next couple totes/boxes (Box 4 above that I ordered with winter weekends in mind), let me know! I'm happy to keep posting these types of updates, but only if you guys are interested. I know I'm not a fashion blogger, but I think sometimes it's nice seeing these items on average people. Or maybe not! No worries either way. Anyone else tried Le Tote? *This post contains affiliate links. If you click the link and choose to sign up for the service, I will receive a small referral fee. Please don't feel like you have to use my referral link at all! Interesting concept. The idea that it's been worn before would bother me. I can see trying it out for a month but I'd definitely want to buy it new, especially at that price! What an interesting concept! I like it more an Stitch Fix. Do you ever get to purchase or keep any of the clothes? I had a similar issue. I live in SC and they kept sending me things with long sleeves! I feel like the concept of Le Tote is a bit better than stitchfix but I wouldn't like receiving clothing that hadn't been kept in good condition like the broken bracelet clasp. That would bother me. I'm totally fine with wearing used clothes but not so used it's broken or torn. Great review! I love the concept of this, but I don't love that you get used items. Especially if they aren't doing a great job of inspecting them for damages, like you described. You got some really great pieces! I especially love that cobalt dress - such a shame it didn't fit! I think this is fascinating. I never think I am hip enough to wear some of these things! So interesting! I've always been curious about them, but they don't go up to my size so haven't been able try them. You're right about that scarf you kept - so much use you can get out of it! I've never heard of this company but it sounds so interesting! I'm definitely interested in getting some new clothes after baby arrives so I'll keep this company in mind! I enjoy these posts!! I've never heard of this company, but I am going to check it out. I agree that I would much more enjoy getting to select all 5 as clothing rather than accessories. I love accessories, but I'd rather pick those out myself. If that makes sense! I really like the idea of this. It's like constantly having a rotation of new-ish clothing. But bummer that the pieces are not thoroughly inspected before being sent out again. That is a major drawback! Interesting! I've never heard of Le Tote, but this is definitely something I could get into! I LOVE Stitch Fix, but not the price, and I never wear things enough to justify buying them! I hadn't heard of this before. I'm interested, but appreciate your honest review of the damage some of your items had. I'm really enjoying these kind of reviews. You're super cute in your "not a fashion blogger" posts and I love your style. I've seen a few people do this and was wondering more about it, great insight. I like the idea of constantly getting 'new' clothes, ha!! Definitely keep sharing what you get. I've never heard of this service but love that you shared it! It is intriguing and sounds like something I'd be interested in, except it seems a little costly. I mean, I do Stitch Fix, which is also costly, but for some reason $20 sounds cheaper than $50. But the $50 is a flat rate right? Like I could get as many boxes as I want in a month? So if I got a box and I hated it all, I could return it right away for another? And then still get more that month? Sounds like an interesting idea, I might have to try it for one month and see how I like it! Definitely keep sharing!!! Also, random question, what kind of tanks do you wear under your shirts? I've been trying to find some new ones but I can't find any long enough that I like! Yes, $50 is a flat rate. You can get as many boxes as you can ship and receive in a month! Ooh you totally have me interested! I loved that blackbird sweater and striped dress on you! What an interesting concept! I don't know how I feel about buying full price items that have already been worn?! That seems a bit sketchy lol. I wonder if they have this in Canada! I love that you can wear the clothes a bunch and then return them. It's like a whole new wardrobe every month or how ever often you choose! I did LeTote for a while last year, and liked the concept. I had some issues with sizing, and eventually cancelled my membership to save $$. I'd definitely be open to doing it again in the future - I start a new job in a couple of weeks, maybe I'll get it again to change things up! I would love to do this but I can't justify $50 a month right now. But I love the concept of it. 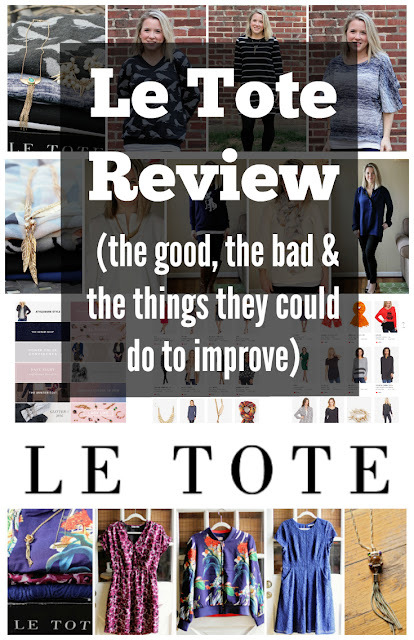 I have wanted to try StitchFix forever and now have also been wondering about Le Tote. I'm always so picky in a dressing room, though, that I worry I would never like much, haha! Maybe I'm too high maintenance! I'm obsessed with subscription boxes, and I've been strongly considering Stitch Fix. I really loved your comparison of Stitch Fix and Le Tote, especially since I'm not very familiar with Le Tote! I've never heard of Le Tote - so interesting to hear about! Got my 2nd tote and all items i got i swapped for, which all worked really well. But my disappointment was that i noticed right away when i recieved my tote one of the shirts had multiple stains on it. I notified them right away and got a quick response. They offered to waive the charge and send me an extra item for my next tote. Honestly, I don't know how long i will be with Le Tote. The selection of clothing are very limited and majority of pieces are boring. Not enough brands, variety of style, and no surprises like stitch fix. Plus i rather buy new. Can you return items at any time and get a new box? For example, if I liked 1 item in my tote but was not ready to commit to buying it, could I send the other 4 back and get a new one directly while "keeping" the 1 item or do you have return all 5 at the same time in order to get a new box? Just a heads up... Once LeTote has you bank info and you decide to cancel...it is an absolute hassle. $59.00 was withdrawn out of my account and I had received nothing until I called to cancel my subscription and get a refund. I left a message and next day I called again. By this time apparently they receive the voicemail and threw together a box of dirty out dated used clothing that wasn't even my size and sent it out that day. So I had to wait to cancel after I received the package and mailed it back in. This was done on their part only to try and justify the charge they made almost 2 months prior. And I am now still out $59.00 for nothing. Also when I first tried to cancel online I found out the only way is to call when you want to cancel. It's a run around. They are only answering calls on certain days during very minimal hours. It is not a quick process. I canceled 5 months ago and LeTote is still trying to access my bank account. Which is soon to be closed out due to this debacle and I'll open a fresh new account. In my experience it is definitely not worth it. Stitch Fix has gone above and beyond to satisfy with NEW trendy clothing. I'll stick with what I know is great! I hope everyone else that tries it has much better luck than I did!! Have a great week!! First tote was great -- 1 thing I didn't like but 2 I loved, and an accessory I loved as well. 1 thing OK. I thought it a victory. Second tote -- they set me up with a long sleeved turtleneck, a cardigan sweater, a long sleeved shirt, scarf and bracelet. For Atlanta end of May/into June. Seriously !?! 88 degrees here all week. Surely they have my address?!? I subscribed in March and thought they'd be planning ahead... When I went to switch them out, the choices were slim indeed -- still had to get 2 items that it will be too hot to wear. If you live on the Canadian border, maybe this service is for you. Just in case you decide you want to cancel, here's another experience: I actually got a few outfits that I liked in the beginning but then I started a job that had a uniform so I wanted to cancel my subscription. I tried to cancel by email but was told it could only be cancelled over the phone. Despite several phone calls, I have been unable to reach anyone. I have only managed to put the account on hold for three months. When the last "hold" was up, and they sent my "tote for review", I started making calls again. After two days of making calls and getting no one, they sent the tote as is and charged me $50. I sent it back and put the account on hold again. That hold is apparently up again. I just received this text and gave this response today. I want to cancel this account. I started a job that required a uniform and don’t need it at this time. If I could have cancelled on-line the same way that I signed up, I might have cancelled and then tried again at a point when it would have worked for me. I tried to reach the company by email and was told that I can only cancel my subscription by phone. I’ve sat on hold trying to cancel my account several times. I have a job that doesn’t allow lengthy periods of phone use. The last couple of totes I recieved, I have paid for without being able to use. I can’t be on the phone at my job for an extended period of time. However, I can be on the internet. Therefore, I will contact every high profile blogger and social media guru I can find to tell them about how this company manipulates people into signing up for a monthly fee that is easy to sign up for but incredibly difficult to get out of. I will sign every review with this: DO NOT SIGN UP WITH LETOTE UNLESS YOU WANT TO DEDICATE $50 A MONTH TO THEM FOR THE REST OF YOUR LIFE!!!! I'm so fed up with this company. While the concept is great, it's not great enough for it to be an authentic system to draw customers without "bait and switch" manipulation. Oh and true to my promise: DO NOT SIGN UP WITH LETOTE UNLESS YOU WANT TO DEDICATE $50 A MONTH TO THEM FOR THE REST OF YOUR LIFE!!!! I have to agree this place is SO HARD TO CANCEL!!! I was able to get someone on the phoe to cancel and actually got my refund only to have a pending charge of $218! For nothing! They do not reply to emails. The clothes were all wrinkled and gross. Beware! Total SCAM!! This is not a company you want to work with. Impossible to cancel except for by phone, but you will already be charged by that time. DO NOT SIGN UP.